Spending a fall semester on Southern Illinois University Edwardsville’s campus is a delight in many ways, especially the first time you experience it, and even more so, if it offers your first visit to the United States. Russasmita Sri Padmi, of Indonesia, arrived on campus in September through the Fulbright US-ASEAN Visiting Scholar initiative program. While in southern Illinois, she’s had the pleasure of viewing beautiful fall colors, a few snow flurries and even her first deer sighting. But what she truly came to consume as an academic scholar is the SIUE Center for STEM (science, technology, engineering and mathematics) Research, Education and Outreach’s innovative strategies and nationally recognized best practices for education programming, professional development and community engagement. When she returns to Indonesia in mid-December, Sri Padmi plans to use this newly expanded knowledge and applied experience to assist in designing and establishing a mathematics teacher training program at her home institution of South East Asia Minister of Education Organization (SEAMEO) Quality Improvement for Teachers and Education Personnel (QITEP) in Mathematics. The Fulbright US-ASEAN Visiting Scholar initiative program is a scholarship granted to ASEAN nationals to pursue professional or scholarly research in the U.S. While at SIUE, Sri Padmi spoke with three different groups of SIUE education students to describe her culture and educational strategies for supporting teachers in her diverse country. Sri Padmi is passionate about delivering mathematics in an engaging way that ignites young learners’ interest in the core subject. Through her work in teacher professional development, she seeks to expand the inclusivity of the Indonesian education system. 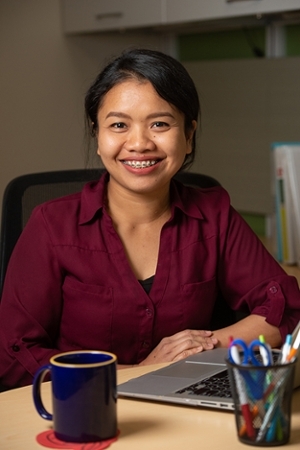 Photo: Russasmita Sri Padmi, of Indonesia, is a Fulbright US-ASEAN Visiting Scholar in the SIUE STEM Center.